Communication to improve your Relationship - part 2. Communication is something we all know is necessary to keep any relationship strong and loving, and although we are aware of the importance of communication, we still seem to be clueless about what exactly good communication really is. This does not mean you are clueless as a person, but it does mean that more attention is required on your part, so that you can become more open and invite the many forms of communication that exist, so that you will be able to understand yourself and your partner much better. There is nothing that keeps a relationship healthy, better than understanding and once you start becoming more familiar with your communicating styles, as well as your partners, you will be able to work better as a team in making the best of your relationship. The first step in achieving better communication that will really work, is to take a look at you first. People always tend to turn to their partner first when things are not running so smoothly in their relationship. They automatically start pointing out what their partner is doing or not doing, as well as how their partner is not listening to them. This may all be true depending on your particular situation, but it is important that you take the responsibility in reviewing your own actions and communication first, before you can point anything out in your partner. Remember, it is very easy to see other people's mistakes, but when it comes to looking at you, it is much harder to accept criticism, even from yourself- because no one wants to be wrong. This is where you need to get real about things. Communication is not about who is right or wrong, but instead about helping each other see things from each other's perspective, so that you can be on the page and avoid any misunderstanding that will cause unneeded arguments. 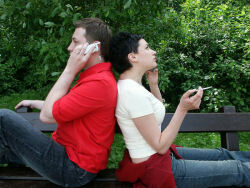 To Continue part two of this article of: Communication to improve your Relationship.